The intellectual properties that the University has provided assistance in developing. Intellectual Property is an umbrella term defined broadly to include inventions, discoveries, copyrightable works, patentable works, know-how, trademarks, trade secrets, and creative or artistic works. Copyrights and patents are covered by federal law, while trademarks and trade secrets overlap between both state and federal law. give the copyright holder the sole and exclusive privilege to copy, distribute, and use his/her works. A work is copyrighted upon its creation – it is automatic for any "original work of authorship" created and "fixed in any tangible medium of expression." Permission of the copyright holder must be obtained before copying and distributing copyrighted works. The creator can register his/her copyright, but registration is not needed to have a valid copyrighted work. A copyright holder can assign his/her copyright to others or license its use. As the author of a copyrighted work, you are generally the copyright owner, but in many circumstances, an employer is considered to be the author. is a word, slogan, symbol, design, or combination of these elements, which identifies and distinguishes the goods or services of one party from others. The primary purpose of trademark laws is to prevent unfair competition by applying a test of consumer confusion and providing rights and remedies to the owner of the trademark. is a grant made by the United States government, acting through the Patent and Trademark Office, to a patent holder, conferring the right to exclude others, for a limited time, from making, using, or selling the invention. It is a legal document in which the invention is fully described, and the scope of the invention defined. In higher education, IP ownership is typically addressed through institutional policy or written agreements. The BYU-Idaho Intellectual Property Policy clarifies who owns the copyright to original works created at BYU-Idaho and how the rights of ownership are allocated between the authors and the University. The IP Policy applies to all University faculty, staff, administrators, full or part-time employees, independent contractors, student employees, and volunteers (“University Personnel”) and any other individuals or entities who seek to make use of University resources or intellectual property. 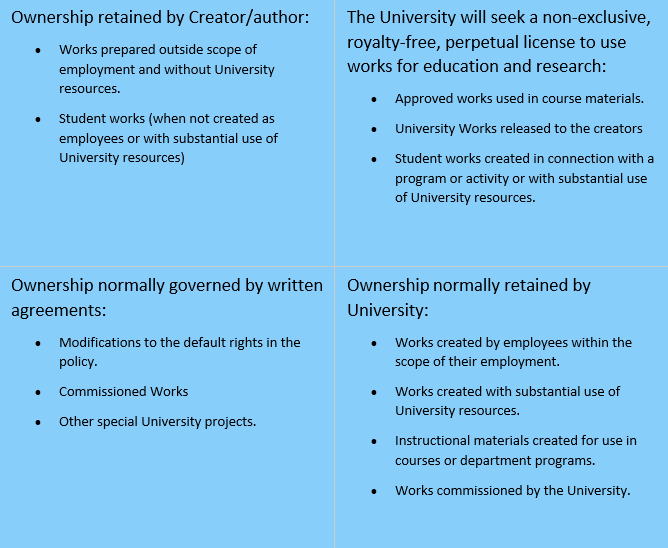 The default position of the policy is that the University owns and controls all Intellectual Property created by University Personnel: i) within the course and scope of their employment, ii) as a work for hire, or iii) with substantial use of University Resources, unless the University enters into a specific written agreement that provides otherwise. When would I be the owner? In some cases, it may be determined that you own the IP --If you have created the work in compliance with other University policies and outside your capacity as a university employee without substantial use of University resources. In such cases, you would be free to utilize the IP as you choose. What is considered Substantial Use of University resources? “Substantial Use” is determined on a case-by-case basis based upon the information available to the employee’s supervisor, chair, dean, managing director or equivalent, in consultation with the Intellectual Property Office. Any paid leave or use of University funding to create a work will always constitute “substantial” use of University Resources. --Incidental use of office space, personal computers, office equipment and supplies are generally not considered “substantial” use of University Resources. Can I use my IP as required course material? You may use your own IP as required course materials with documented approval from your department chair and dean. The University may make the approval contingent upon allowing the University free use of the IP for educational purposes. This approval process helps mitigate conflicts of interest, maintains the highest quality education at the lowest possible cost, and ensures responsible stewardship of the sacred tithing and tuition dollars that fund the University. Non-employee students own their works created through their participation in programs of study at the university and will retain the ownership rights, with the reservation that they allow the University free use of the IP for educational purposes for those works created with substantial use of resources. Can I obtain rights to University owned works I create? To obtain rights to works owned by the University, you must follow the process to request a written modification to the default allocation of rights in advance of substantial effort on the work. Failure to obtain a written agreement in advance will default to the allocation of rights provided by the IP Policy. How can I avoid ownership problems? Comply with all university policies and procedures and notify your supervisor, department chair and dean or managing director when creating intellectual property by assignment or when using Substantial University Resources or when mentioning a connection to the University or when the intended creation of Intellectual Property holds possible commercial value. Avoid the use of University resources or facilities that are not exempt, as stated earlier, in the creation of the work. Remember that you are required to obtain prior written approval of any modified rights agreement or when using your own IP as required course content. What if I don’t agree with a determination of ownership? A claim or dispute is first submitted in writing to the Intellectual Property Office and to your dean, managing director or equivalent. The Intellectual Property Office reviews the claim, consults appropriate University offices, the claimant, other members of the BYU-Idaho community, if applicable, and issues a determination. If the claimant is not satisfied with the determination, he or she may, at their option, forward a letter to the University Resources Vice President via certified mail, detailing the claim to be resolved. Who manages Intellectual Property owned by the University? The BYU-Idaho Intellectual Property Office has the stewardship over the management of Intellectual Property ownership and use rights at the University and the review and approval of individual agreements that modify the default allocation of rights provided by the IP policy, subject to review and approval by the University Resources Vice President and the Office of General Counsel. If you have questions about the policy or need assistance in completing the forms, contact the IP Office in McKay 120c or visit https://www.byui.edu/copyright.